Description - Mohawk's Variation vinyl planks beautifully capture the natural variations within hardwood floors, but with the durability of a vinyl product. These wood look planks are 100% waterproof and petproof, making them the perfect flooring solution for any room in the home. Material – Variations planks are from the SolidTech hard surface flooring collection. 100% waterproof vinyl plank flooring is constructed with 100% virgin vinyl, containing no recycled content, has a high density core and Uniclic Multifit system for faster installation. Revelance features attached underlayment. Size – Variations Vinyl Planks are 7" x 49". 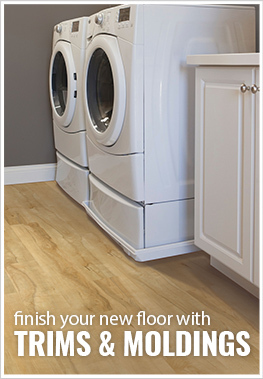 Recommended Uses – Variations vinyl planks have been successfully installed in many areas throughout the home, including bedrooms, basements, kitchens, laundry rooms, family rooms and more. Mohawk’s Variation waterproof vinyl planks are beautiful and come in high variation patterns to give an attractive and randomized look across your floor. At 7” wide and 49” long, these large format wood look vinyl planks and comparable to the real deal hardwood flooring as far as looks, but are more durable. Love the way this floor looks in my kitchen!